Save your left-over Rotisserie chicken and left over veggies and whip up this quick and delicious Asian style dish. For best results cook your rice the day before. 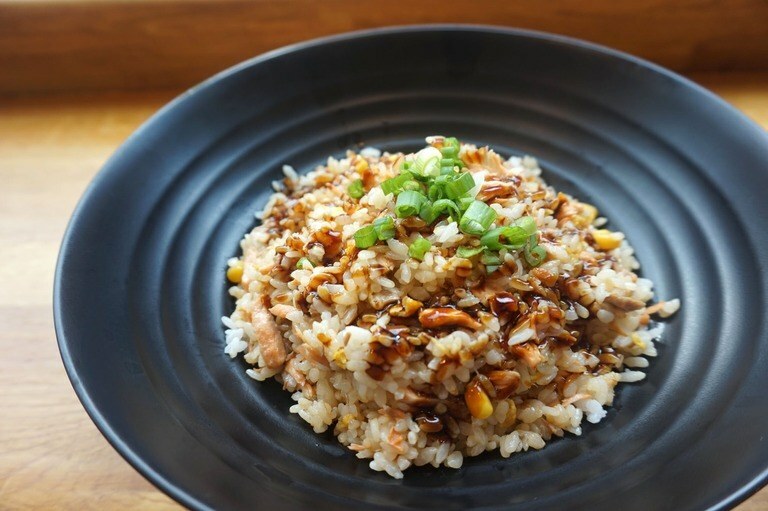 Using cold rice for this recipe will turn out the crispiest! Add oils; swirl to coat. Add carrot and broccoli; stir-fry 3 minutes or until crisp-tender. Add chicken, peas, 1/2 cup onions, garlic, and ginger. Stir-fry 2 minutes or until onions are tender. Add rice; cook 3 minutes or until thoroughly heated, stirring occasionally. Push rice mixture to 1 side of pan; add eggs to opposite side of pan. Cook, without stirring, for 10 seconds. Cook, stirring frequently, 2 additional minutes or until eggs are scrambled. Stir in soy sauce, salt, and pepper.